When we dine out, I frequently get an espresso after my meal. Espresso when dining out is often the perfect cap to a good meal. Often times I’ll order an espresso just to see whether the restaurant takes it seriously. More often than not, I’m disappointed. One thing that’s needed for a high-quality espresso is that the beans be freshly ground. Many restaurants don’t like to do this because of the noise. While I well understand this, and there are some decent pods, some restaurants have people pulling shots that were never shown how to do it. The result is inconsistency. This would be an easy thing for them to fix. Pulling a decent shot isn’t hard to learn. Probably the most surprising thing for me is that many restaurants don’t have espresso cups or demitasse spoons. They serve espresso in a coffee cup, and give you a teaspoon to go with it. The bad thing about a coffee cup is that if it hasn’t been preheated, it takes most of the heat out of the espresso. Also, because of its depth and interior area, most of the crema (the tan creamy froth on top of an espresso) winds up stuck to the inside of the cup). What’s really objectionable is espresso that’s been over-extracted because someone that doesn’t know what they’re doing pulls too big of a shot. A large espresso should be about 2.5 ounces. It shouldn’t be 4 ounces! Unfortunately, I’ve gotten way too much espresso on occasion. Again, pulling a decent shot isn’t hard. But many restaurants don’t bother to train people to do it correctly. 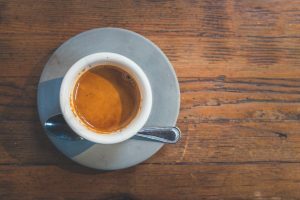 If you’re wanting to have espresso when dining out and you don’t want a fine meal tarnished, be sure to inquire with your waiter/staff before ordering. Ask them a couple of clarifying questions before ordering. If you take the time to ask before ordering – chances are you’ll be thankful you did.